As faculty and students at Walters State increasingly use mobile devices in their work lives, in their family lives, and in their leisure life, so too they are increasingly using mobile devices in the classroom. 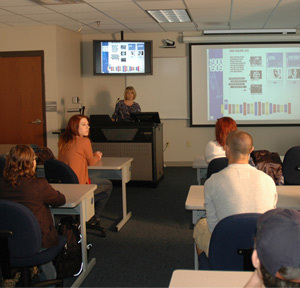 Walters State supports mobile learning and the use of mobile devices for teaching and learning in a number of ways. The college seeks new ways to assist faculty in their use of mobile learning both inside and outside the classroom. The college has purchased over 700 iPads for student use. These iPads reside in iPad carts and cabinets strategically placed in academic buildings at all of Walters State. Carts hold 30 iPads each, are portable to classrooms, and are used by instructors in the classrooms to give every student a device during class. A central calendar for each iPad cart enables faculty members to schedule iPads for use in their classroom instruction. New mobile BYOD podiums are being purchased for classrooms as a way to reduce costs and increase teaching and learning with mobile devices. These BYOD podiums are less expensive than "smart classrooms" and allow faculty to bring their own devices into the classroom and are device-agnostic. Mobile document cameras allow faculty to use documents, objects, images, and models as they project to the podium and the classroom projector. Some of these cameras can be taken off their stands to more easily maneuver the camera in the classroom for in-depth study. A number of iPad stands are available for stationary use of the iPad. The stands hold the iPad and allow for easy use on the classroom podium, on the faculty member's desk, or on laboratory tables. Some stands include built-in docking to allow for amplification of video and audio recordings; others allow iPads to be attached to reading tables for student use in labs, reading areas, and the Library. A mobile document scanner allows faculty members to scan documents into their cache of documents for student use in either the camera roll of the iPads or for distribution via the Dropbox app so each student can read, annotate, and discuss an image, essay, or article. The college has recently undertaken an extensive revamping of its wired and wireless infrastructure to take advantage of mobile learning. A new, more-intensive wireless system of connecting to the WS network and the Internet now allows all classrooms to run 30 or more wireless devices simultaneously as instructors give mobile devices to students to use inside the classroom. Building architecture was analyzed and new access points installed to allow for the smooth and continuous operation of wireless devices in the classroom. 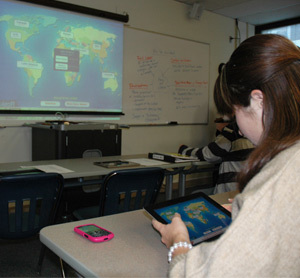 Students can log into the college's wireless system via the college's iPads or their own wireless devices to interact in classroom presentations, discussions, and class-response polling apps and software. Finding students are heavily interactive with one another, with their instructor, and with objects on the Internet via mobile devices, the college's Instructional and Educational Technologies Department has created a new network for mobile, wireless devices throughout our campuses—the MobileDeviceNet to which all iPads immediately connect after being turned on. Some recently-purchase software that operates on wireless devices reaches students on all campus simultaneously using the college's MobileDeviceNet. For faculty members working in facilities outside the WSCC campuses, a number of mifi (mobile wireless access devices) have been purchased. When faculty members teach in high schools in surrounding counties or take their classes on fieldtrips to museums, parks, or the surrounding community, they are able to use mifi technology to connect WSCC iPads to the Internet. For example, one Spanish class interviews native Spanish speakers at a local Morristown restaurant and uses the iPads to connect to the Internet as students fill in surveys and questionnaires in Spanish in response to the interviews they conduct with native speakers. New courses are being offered as mobile learning and technology spreads across the industries for which some of our students train. The new video production course in the Communications Department will be using new iMac computers to edit videos they shoot for class projects. The photography class will share the new library lab for Apple computers as will the editors of the college's award-winning Gallery fine arts journal. In addition, the lab serves as an incubator for innovation in media production via iOS devices. The Instructional Design Team (IDT) plans, co-ordinates, and delivers training in teaching and learning technologies for faculty members (and in some instances, staff) at Walters State. Formed in 2008, the IDT has grown from three members to the current eleven members as it role and functions at the college have grown and changed. Trainings delivered by the IDT cover topics such as using particular apps, the set up and management of mobile devices by faculty and staff, upgrading iOS systems, using the iPad and iPad carts in instruction, searching the App Store, the tools of mobilization, presentation apps, quizzing apps, class response apps, and productivity apps, to name a few. Faculty members also visit the IDT for one-on-one sessions, and members of the team visit faculty members in offices and classrooms and other public spaces on campus to ensure faculty members are supported in all the teaching and learning technologies they need.